A residential zone is an area designated for home-building. 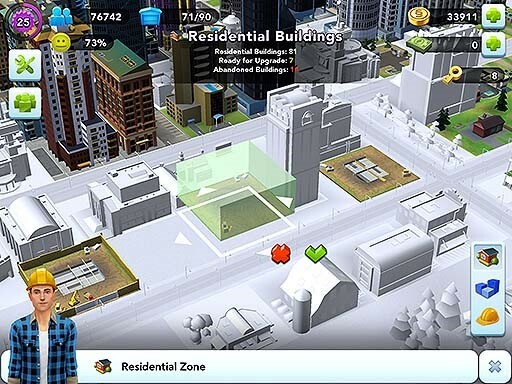 Tap the residential zone icon on the right of your screen. Now you’ll see your residential buildings displayed on your city map, as well some useful stats - the total number of buildings you have, how many of your buildings are ready for upgrade and how many have been abandoned. Toggle between two other views – Land Value and Wealth Forecast. Tap the blue column icon to see your city map in varying shades of blue. This is the Land Value of your city! The darker the blue, the more desirable that area is; it means that spot has exceptional Services and Specializations. 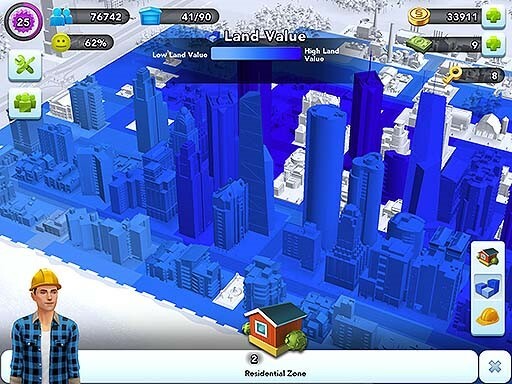 Wealthier citizens like to build their houses in darker blue locations, so try to place your zones there. To see how Land Value will affect your next residential upgrades, tap the yellow hard hat icon to see your Wealth Forecast. 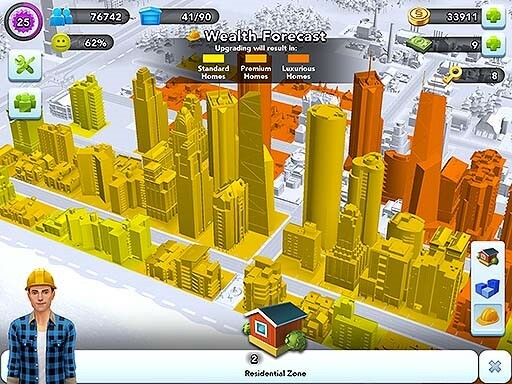 Upgrade in the darker orange areas and the buildings could end up looking very luxurious indeed! 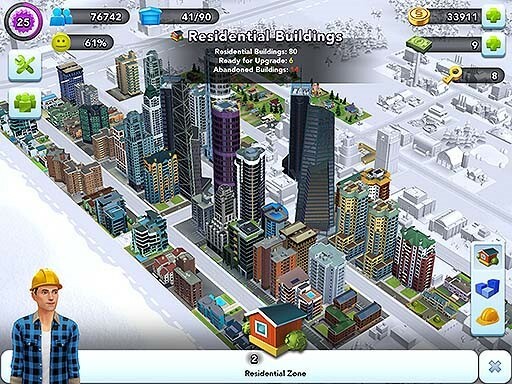 To build: Drag a residential zone onto the city map. The white outline beneath the zone shows where the footprint of your building will lie. It must be next to a road and not overlapping any other property. Zoom or rotate your view if you need more detail, then tap the green checkmark to confirm your choice. Look closely—contractors are already busy laying ground works! Tap the X on the far right to exit the residential zone view. Now you can see a yellow hard hat icon. Tap this to see your building plans. Building plans: Homes don’t grow on trees you know—planning is involved! 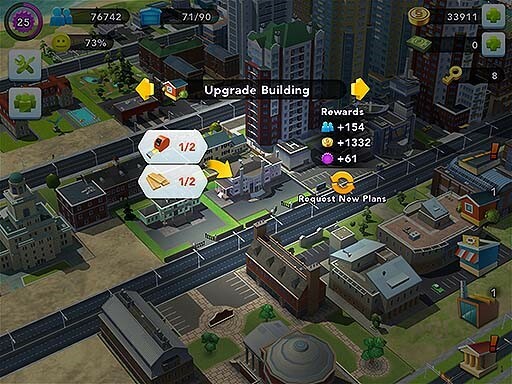 Building plans show the materials needed to build homes, the population of the building, and the Simoleon and XP rewards you will earn once construction is complete. Collect the materials on the list by crafting and manufacturing, so your contractor can get started. If you see a green check mark next to the hard hat icon, you already have all the items you need! ProTip: Super-efficient Mayors can quickly scroll between each residential zone by clicking the yellow arrows now visible on-screen. If you’re short on time you can buy missing materials instead of manufacturing them. 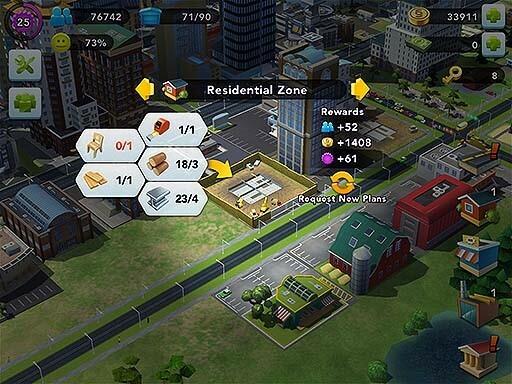 Drag the building plan items on top of the residential zone and tap the yellow button to use your SimCash. These plans are terrible. Get me a new architect! If you don’t like the materials on the building plan, tap "Request New Plan" to reshuffle for some different items. Getting new building plans drawn up takes time (hey, you fired the original architect! ), so tap the blue timer icon appearing over the zone to see how long they’ll take. If you don’t want to wait, the architect can be persuaded to speed up the plans (slip him a little SimCash for, wink-wink, “inspiration!”). When you’ve gathered all the materials you need, drag them on top of the residential zone and you’ll instantly be rewarded with Simoleons and XP. Behold! Your building is complete! I built in the wrong place. What can I do? Moving a building is easy: Tap and hold the building you’d like to move, drag it to a better spot, and tap the green checkmark. Remember that all buildings must be next to a road! Bulldozing: If space is really, really tight and you’d like to remove a building completely, tap and hold the building, then tap the bulldozer icon that appears on the right side of the screen. A confirmation message will appear. Remember two things when bulldozing residential zones: They don’t cost Simoleons to build, so you won’t receive any refunds when you demolish them, and doing so will reduce your population! Can I rotate my building? The building contractors automatically position any buildings to face the road it is sitting on, so there is no need to rotate a building. Upgrading an existing residential zone: Upgrading is important to increase your population and also to keep your citizens’ happiness levels up. Wherever you see a yellow hard hat icon, a building is ready for an upgrade. Tap the icon to see the building plans and rewards available, then get manufacturing! As long as your citizens are happy, they will want to upgrade until the building is so wonderful it can't be improved upon. There will come a point where you cannot upgrade a residential building any further, time to start spreading your city out! What happens if my building becomes abandoned? If the worst happens and citizens start to move out, it's a small comfort to know that an abandoned residential zone will not draw on your services, and upgrading a residential zone will not need extra services either. You can recover from this, Mayor! Make sure that area is safe for your citizens to move back into, connect them with the right services, and they will start to return by themselves.